Successfully Added Mebook - 7 Inch High Resolution eBook Reader + Super Media Player to your Shopping Cart. But so much better than both... Such rewarding functionality packaged in a slim body that is light and sturdy with a 7 inch high definition screen along with 2GB of internal memory and a TF microSD card slot for further memory expansion along with a heavy duty 1800 mAh battery all leads to one simple conclusion - The Mebook is sure to be your favorite electronic gadget for many years to come! Brought to you by the leader in cutting edge electronics - Chinavasion. It is a great value for the price paid. Very useful gadget: 1. 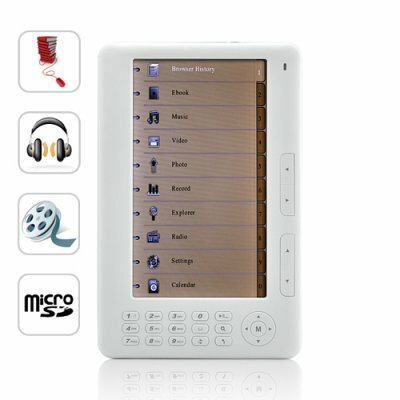 Ease of Use, 2 Soothing display, 3 Displays and plays most of the video, audio, images and ebook are important features. Ordered the reader on thursday and it was delivered to my home on Tuesday ! Over the weekend all the way from china to the Netherlands. Excellent service. Product is very good! Take a few months, very satisfied. Video and sound great!